The German-Jordanian University (GJU) is a public university located in Amman / Madaba. It was founded in 2005 by a Royal Decree, in accordance with a Memorandum of Understanding reached between the Ministry of Higher Education and Scientific Research of the Hashemite Kingdom of Jordan and the Federal Ministry of Education and Research of the Federal Republic of Germany. In August 2004, a founding committee began up its activities in Jordan. The committee was in close cooperation with the Ministry of Higher Education and Scientific Research. At the same time, the German Project Office opened at Magdeburg University of Applied Science. The project is funded by the Federal Ministry of Education and Research (BMBF) and the German Academic Exchange Service (DAAD) under the category "German Study Programmes Abroad". The University was modelled on the German applied-sciences model, characterized by its focus on putting knowledge into practice and promoting knowledge transfer. The GJU aims to play a significant role in promoting links between Jordan and Europe, particularly Germany. By taking advantage of the best educational practices in both Jordan and Germany, the University has positioned itself as a leader in its field. 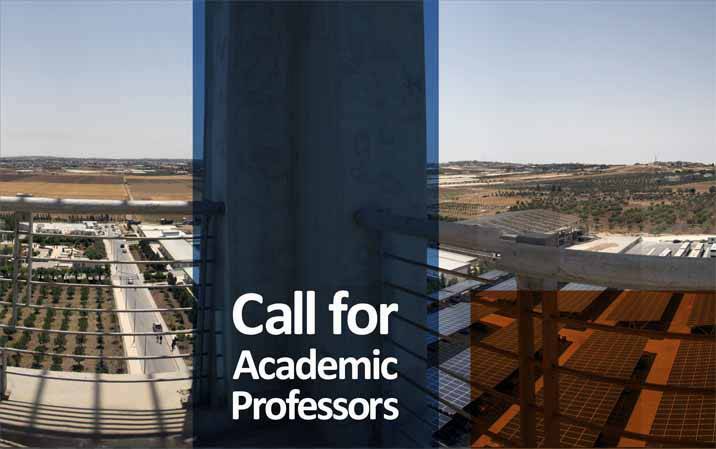 The German Jordanian University is looking for A Full Professor or Associate Professor specialized in Sustainable Buildings to be assigned as an academic staff for the Sustainable Buildings Master program at the School of Architecture and Built Environment (SABE) in Amman. PhD holder in Sustainable buildings or similar field. Has published research papers within the last 3-5 years in renowned journals. Has a list of research publications in renowned journals with no less than 10 publications. Experience of five or more years in teaching at academic institutions. Practical experience of five or more years in the field. Contract based assignment according to the university‘s rules and regulations. German or EU passport holders can receive a top-up amount from Magdeburg University of Applied Sciences as GJU‘s German project managing institution. Receiving such a topup depends on the candidate‘s qualifications and experience and is bound to DAAD regulations. For the Associate Professor teaching 12 credit hours equivalent to 18 ECTS (around 20 contact hours). For the Full Professor teaching 9 credit hours equivalent to 12 ECTS (around 15 contact hours). Participating in the School of Architecture and Built Environment (SABE) and the department committees and any academic tasks given to him/her. Cooperating in the development of the study plans and the syllabus of the taught subjects. Supervision of Master students‘ theses.